If you are looking for an exciting European city to visit, then read this Insider’s Guide to Athens. Athens is the capital of Greece and its largest city. It is named after the goddess of wisdom, Athena and has been nicknamed the “Cradle of Civilisation” and “City of the Violet Crown”. It is one of the oldest cities in the world, with origins dating back to 3000 BC and is the home of the Olympic Games. During the Classical period, it was one of major cities in the world. Athens has had bad press recently; however don’t let that put you off making a trip. There is plenty to see and do whilst visiting the city. First stop definitely has to be the Acropolis, which is one of the most familiar and well-known landmarks in the world. If visiting during the summer months, go very early in the morning to escape the extreme heat and the crowds. It’s quite a climb, but when there it’s totally worth it. 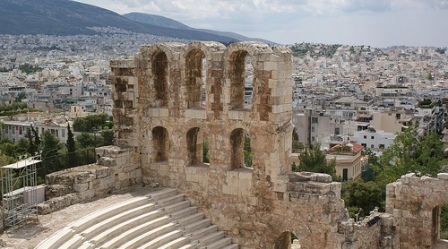 From the top of the Acropolis you get an beautiful 360 view across the city . Besides the Acropolis you should visit the Parthenon, Old Temple of Athena, Poseidon, and the Acropolis Museum. The archeological sites are beautiful and make me wonder how people could have build these sites back in the ancient time. 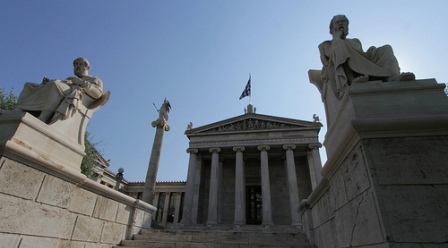 The Academy of Athens is also another must place to visit. The neoclassical building from the 19th century is located in a beautiful street next to Athens University and the National Libary. The complex was designed by Danish architect Theophil Hansen. The statues of Apollo (the guitar-player) and Athina (the defender) are very impressive and definetely worth a quick stop. A trip to the oldest district of Athens, the Plaka, is a must, with excellent restaurants and workshops of artisans. It is a great place to go for a stroll in the evening, or you can take the trolley bus, which will take you on a tour through the streets. Afterwards, enjoy a meal at one of the many cafes and restaurants. However, if you want to get out of Athens for the day, especially if you want to escape the searing heat, visiting the neighbouring greek islands of Aegina, Poros and Hydra which are perfect for a day trip. 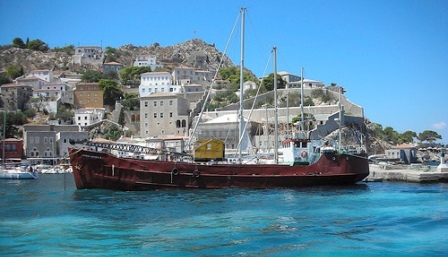 Take the Flying Dolphin from the Port town of Piraeus, which runs fairly frequently. Each island has its own unique charms. One of the best times of year to visit is Easter, which in Greece is a feast more important than Christmas. Visiting at this time of year will give you the chance to experience the Easter cultures and traditions. One such tradition is that on Holy Saturday, people attend church at 11pm and bring their baptismal candles in order for them to be lit with the Holy Flame. At Midnight, people then wish each other “Christos Anesti” which means “Christ is Risen”. Greeks are in general a warm, hospitable people. Visit Athens and enjoy this hospitality and revel in the culture, cuisine and history that this lovely city offers.